Varberg is an attractive community, based in the south-west coast region of Sweden, with a long history of growth. In fact, 2017 marked the year where the municipality experienced 60 years of continuous population growth, which is quite unique in a Swedish context. Only 14 municipalities in Sweden have achieved this. The city of Varberg is ideally located in the historic city centre, right next to the coastline and boasts a rich and diverse countryside. Our location is exceptional – right in between two of Sweden’s fastest-growing regions, The Greater Gothenburg region and the Greater Copenhagen region. The Swedish Government is investing heavily in the west coast railway to increase the capacity for commuting and to connect cities and regions along the way. 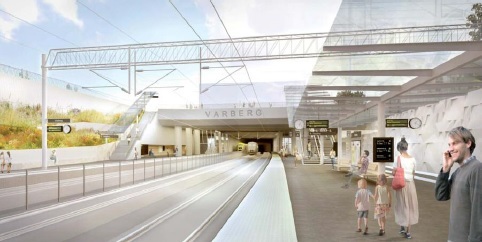 In Varberg, this means our section of the railway will be in a tunnel under the city centre. To make the most of this, we will move parts of our harbour and have already begun planning for a new waterfront area that connects the city centre with the coastline, which will remove any industrial barriers. In the 1950s, Varberg was “discovered” by people in Sweden’s bigger and more industrial cities. This, of course, coincided with the larger availability of cars to a greater number of people. Before that, the towns along the south-west coast of Sweden were mostly dependent on the fishing and farming industries, but suddenly the tourist sector exploded when the demand for city people to take a summer holiday on the coast increased. Varberg is one of the cities that has really flourished because of this development, whereas others flourished for a while and then slowly went into a quiet slumber. That Varberg is different from other communities is obvious in so many ways. It can largely be attributed because there is a high level of entrepreneurship here, indeed there is a very diverse business sector in the municipality. This ranges from the large-scale industrial production of timber, pulp and energy, to countless hotels and restaurants that serve Varberg as one of Sweden’s most popular spa and coast resorts – all year round. Varberg is in many ways a hidden gem, but more and more people discover the city as a place to settle down. It’s less than an hour away by car or train to Sweden’s second largest city (Gothenburg) and the airport of Landvetter, Varberg is well connected. Varberg is really making the best of its fortuitous position today. 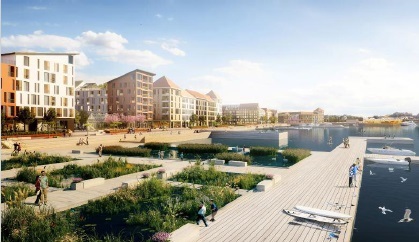 The building boom in Sweden is also apparent here, indeed new residential areas are the results of wise planning for developing former industrial properties and using fill in sites to make the city more interesting for everyday life. Although most of the development for housing is focused on the city, we strive to involve residents living in our more rural communities too. We engage people in the decisions that have the greatest effect on their everyday life. Through dialogue and local action plans, we work together to see where public and commercial service, infrastructure and housing will come to best use. It is also a way for our citizens to meet with local politicians and decision-makers and share their thoughts about how the municipality can be made even more attractive. A sustainable society needs to be based on people empowerment and the foundations of democracy. New forms of meetings are important for reinventing the community. Our aim is clear, and we are acting on it. We are building a community converging around means of public transportation and a sustainable lifestyle.